People walking around with the Chinese symbol for "cheese" or "horse" tattooed on their arms is bad enough, but now there's a new terrifying way for the underclass to express themselves coming - embedded LED lighting systems. John Rogers and his team at the University of Illinois have been doing their bit for extreme body art by creating waterproof, bendy LEDs, which are soft and durable enough to be inserted under the skin. TOKYO FLASH: Built-in TV remote controls? It's a great way for David Beckham to enhance his earnings potential by flashing "GILETTE MACH 3" in red type across his shoulders. The boring, serious medical implications that we feel duty bound to report include making illuminated gloves for surgeons, so they can see what they're doing when wrists-deep inside people's chest cavities. It appears that famed scientist and inventor Ray Kurzweil has been reading a bit too much high concept sci-fi. Speaking at a future-looking event recently, he claimed that we'll soon be able to make "back ups" of our brains, with the required technology to do so hopefully available within the next 20 years. Bonkers Kurzweil imagines a relatively near future when "thousands of nanobot" machines trawl our bodies, somehow managing to get our experiences and memories out of our brains. And, probably, directly onto Facebook and Twitter. Notorious gaudy phone customiser and headline grabber Stuart Hughes has really taken it too far this time. He's spurned today's austerity society by somehow managing to create an iPhone with an asking price of five million pounds attached to it - see image above. 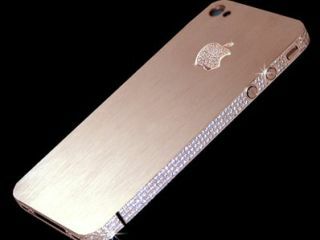 The phone has been embedded with around 500 little diamonds. He's also put gold on it, which hopefully won't have too much impact on the phone's already slightly dubious signal quality. And it doesn't come in a box - it'll arrive (at Kanye West's house) in a 7kg carved granite chest. Stuart's making two of them. Stuart's living in hope. Super Twario, as long as it doesn't get ordered off iTunes by Nintendo before these words hit the internet, is an amazingly clever take on Twitter. If you find endlessly scrolling down a little old hat, the app takes your Twitter timeline and displays it horizontally - making the act of reading updates about the working days of people you hardly know slightly more fun. It's not just a static list, either - Tweets are scrolled by players/readers tilting the phone, with tapping and swiping helping you race through the "levels" quicker. It's Game Centre enabled so there'll be plenty of Achievements to talk about on Twitter.